Edie Bea’s etiquette tea parties are held for children from three years old and the cost is $595 for 8 to 12 children. Introduce your children to ye olde English custom of tea drinking. 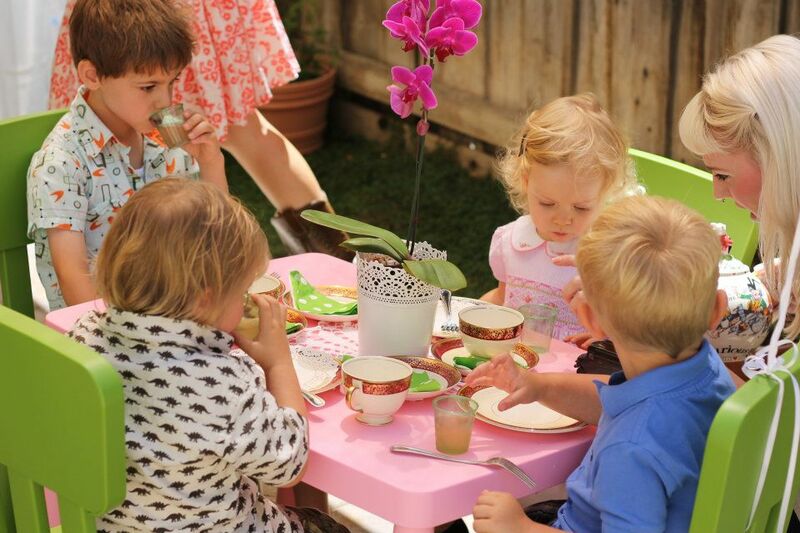 Miss Jo Jo will personally call at your own home and set up the perfect traditional tea party. As she pours tea from her magical pot while dressed in her vintage party dress and apron her English accent cannot fail to charm your little ones. They will learn many etiquette tips along the way! Sit back and enjoy as Miss Jo Jo charms your guests and takes them on a journey they won't soon forget. Tea is traditionally served between 11.30 am and 12.30 pm or 3:00 - 4:00 pm. Miss Jo Jo is a stickler for tradition, please note the time slots when making your booking. Once you've booked your party Miss Jo Jo will work with you to start planning for the big day. She will hand write each beautiful tea party invitation and post them 3 weeks prior to your event. The excitement will begin to build as you receive R.S.V.P. 's and prepare for the party. Once your guest list is complete Miss Jo Jo will make the arrangements and get to work on finalizing the details, saving you the time and trouble of doing it yourself. She'll even educate the birthday girl or boy and present them with thank you notes insuring that they know exactly what expected from them once they have received guests and gifts at their home - After she has done the dishes of course! Miss Jo Jo will arrive an hour before your party begins and start by decorating your home with balloons, fancy vintage table cloths, pretty doilies, home made bunting, sweet posies and dainty china cups and plates. Each guest will be greeted by Miss Jo Jo and the fun begins! Guests will be directed to a craft area and start by creating their own doily, which they will use later at their place setting. Once all of your guests have arrived and finished designing their doilies, Miss Jo Jo will explain what etiquette is and why it is important. Before your very eyes, your guests will learn how to carry themselves and utilize proper manners, which is a dying art. Who'd have thought there was a correct way to ask for a cake or that there was a proper way to leave one's napkin when vacating the table? Party guests will then adjourn to the tea room setting where a delicious selection of sweet and savory treats await to delight even the pickiest of pallets. Before the tea service begins, each guest will introduce him or herself. Miss Jo Jo will continue with the etiquette lesson as she educates your little ones on correct table manners. Miss Jo Jo's love for manners will shine as she serves tea (or other suitable beverage) straight from the pot. Once the tea service is complete, it's time to work off some of that energy. Turn up the volume and let the games begin! From Pass the Parcel and Musical Chairs to Pin the Spout on the Tea Pot and Musical Statues. 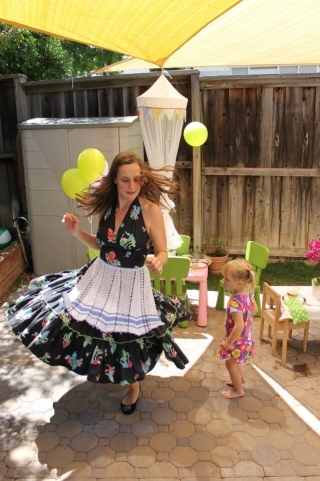 Miss Jo Jo will design an age appropriate plan to entertain and delight your guests. Once the games conclude Miss Jo Jo will thank your guests and leave them with a final thought on their newly learned lesson in manners (and an optional goodie bag should you desire). You are welcome to continue on with your party as Miss Jo Jo collects her supplies, cleans up and bids you and the party goers farewell. Now may be a perfect time for present opening. See our available pre-packaged theme parties. Check for availability and Book now or if you need more information you can contact Miss JoJo for more information.